Whatever your musical passion may be, we're here to help you shine! Choose from a range of Bachelor of Music, Bachelor of Arts, and Master of Music degrees. 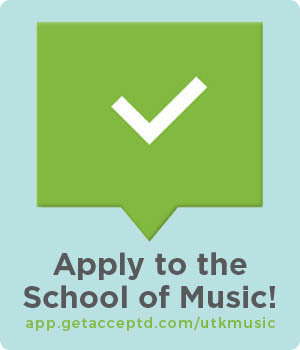 We also offer certificate programs, music minors, and opportunities to double major. When you visit the UT School of Music, you'll have the opportunity to meet your future professors, sit in on classes and ensembles, and chat one-on-one with your First Year Experience Coordinator. Enjoy any of our 200+ performances held each year. All School of Music events are open to the public, and most are free! Performances range from student recitals, to world-renown guest artists, from instrumental workshops and conferences, to guest lectures. Receive bi-weekly performance lineups, headline music news, and special event invitations to your inbox.